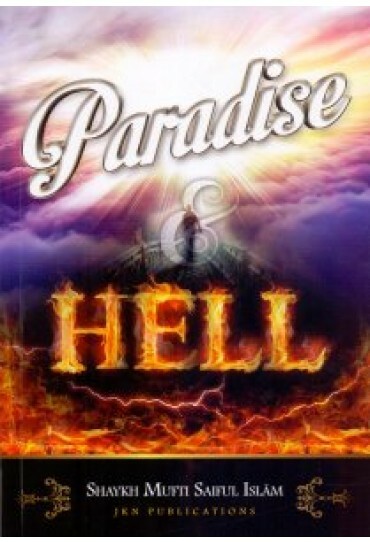 This book is a detailed description of Paradise and Hell including the state and conditions of its inhabitants. All the details therein have been taken from reliable sources. The purpose of this its compilation is for the reader to contemplate and appreciate the innumerable favours, rewards, comfort and unlimited luxuries of Paradise and at the same time take heed from the punishment of Hell. Shaykh Mufti Saiful Islam has presented this book in a unique format by including the Tafseer of Surah ar-Rahman. Shaykh Mufti Saiful Islam is an Islamic scholar and is the Founder, Principal and Director of Jamiah Khatamun Nabiyeen (JKN), an Islamic Institute and centre for learning in the heart of Bradford, England, UK. He is one of the leading scholars in UK and is also recognised internationally for his major contributions in lectures, teachings and book writing. He is a leading scholar of classical learning in Islam and has promoted Islamic sciences and classical teaching methodologies. He also took up responsibilities in many other departments locally, nationally and internationally. He is also the Editor of Al Mu'min; the famous family magazine. He currently holds the posts of President of Tawkkulia Jami Masjid; Chairperson of Al-Kawthar Welfare Foundation; Chairperson of Jamiatul Ulama UK; Vice-Chairperson of Majlis Tahaffuz-e-Khatme-Nabuwwat (Bradford) and Vice-Chairperson of Izhar-e-Haq in Oldham. He is also the patron of Al Mu'min Primary School, Olive Secondary Schools for both boys & girls and Al-Huda Academy in Oldham. Shaykh Mufti Saiful Islam is also the Founder & Patron of Jamiah Zakariyya, situated in Biswanath, Sylhet and Jamiah Al-Kawthar, which is situated in Netrokuna, Mymensingh as well as many other Makatibs in Bangladesh.